Cobra Energy Drink will be bringing back in Cebu the Philippines’ most awaited race, the Cobra Ironman 70.3 Philippines. This Cobra Ironman completion will be at its 5th year and is expected to be the biggest and grandest so far. This sporting event will be starting at the Shangri-la Mactan Resort and Spa on August 4, 2013. More than 2,100 participants coming from 35 different countries are already registered in this triathlon and more are still on the waiting list. Pros, amateurs, locals and foreigners are expected to show their stuff when the race begins here at the Queen City of the South. Slots for the competition sold out in just 4 days. Three time will Pate Jacobs is expected to join this years event, so are some local celebrities and popular businessmen and company SEO’s. Other favorites for this race are Chris McCormack, Courtney Atkinson, Cameron Brown and Ben Allen. 15 time Ironman Champion Belinda Granger of Australia is still the favorite to win the women’s category. This year’s Cobra Ironman Philippines will be one of the biggest competition in Asia for not only does it fall as one of the country’s most prestigious sporting events, but the winners for this Ironman race will get to qualify at the Ironman World Championships Las Vegas in Henderson,Nevada in the US. The Ironman World Champisonships will be held on September 8, 2013. 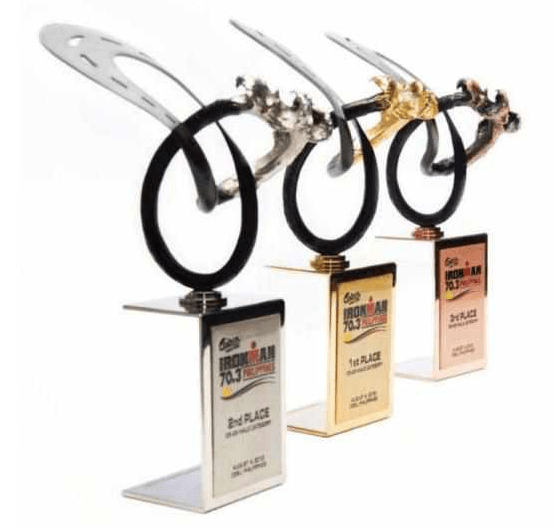 As an added bonus, world renowned designer, Kenneth Cobonpue was tasked to design the official winner’s trophy and medals for the 2013 Cobra Ironman Philippines. Let us support Cebu and other local athletes in this Ironman competition. Mabuhay!!! Like We LOVE Cebu on Facebook to get more news, events and happenings, travel and food reviews and everything about the Queen City of the South.